HUNDREDS of mourners packed into a rural Sligo church this morning to say a heartbreaking farewell to two brothers who were “the best of buddies”. The coffins of nine-year-old Brandon Skeffington and his 20-year-old brother Shane Michael were carried into St Attracta’s Church in Tourlestrane Co Sligo in the bright sunshine as mourners held back tears. 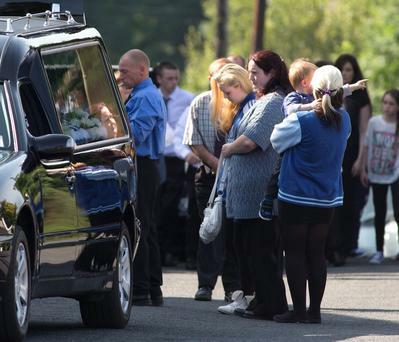 The boys parents Shane and Carmel and siblings Sharon (15) and three-year-old Callum were comforted by relatives and friends as they made their way into the church to say farewell to their sons and brothers. Local parish priest told the congregation that while they were gathered in sadness there was also so much goodness which was evident in the community over the last few days. “Our sympathies go out to the Skeffington family on the death of Shane Michael and Brandon. It might seem a very bare statement to make, but words are difficult for us all at this time,” said Fr Glynn. A prayer read on behalf of the family read during prayers of the faithful spoke of how the two boys would be forever together and never forgotten. Among the gifts brought to the altar to remember the two brothers was a football and a transformer toy. Fr Glynn told the congregation how the two brothers would often play football together and had bought the ball during one of their many trips in Shane Michael's car. The mourners were also told that Brandon was fond of reading 'Simpsons' comics in the classroom - hiding them under schoolbooks so teachers wouldn't see. Just five days ago their lives were left shattered after Shane and Carmel returned home to find their nine-year-old son Brandon lying at the landing at the top of the stairs with stab wounds. Moments later they discovered the body of their oldest son Shane in the shed behind the family home. A post mortem revealed that nine-year-old Brandon died after being stabbed in the chest by his older brother Shane who then hanged himself in the shed behind the family home. Gardai believe that Shane, who had battled drug problems in recent months and spent some time in St Columba’s psychiatric unit earlier this year, attacked Brandon with a knife after a row broke out between them over a video game.